Glow in the dark bangles for parties and events. Glow Bangles are 8 inch flexible glow sticks with connectors. Simply remove a glow stick from the pack. Bend the glow stick making sure you feel the inner tube break along the entire length. Use a connector that is provided to join the two ends of the glowing glow stick together around your wrist. 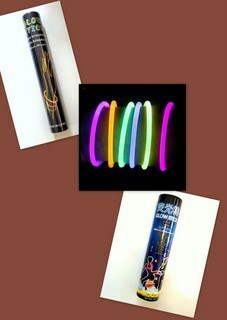 You can also join a large number of glow sticks together to make a variety of items. You can connect three together to make a glowing necklace.